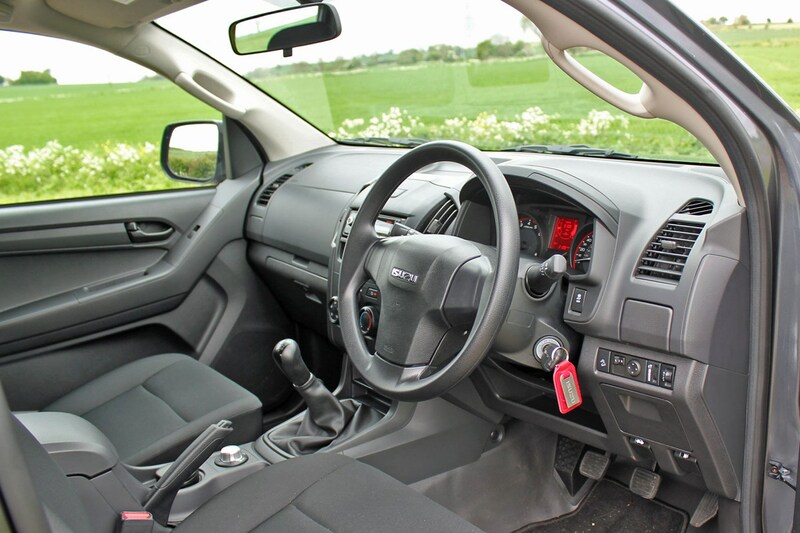 The Isuzu D-Max pickup was first introduced into the UK in summer 2012 as a replacement for the previous Isuzu Rodeo pickup, and was significantly updated with a new engine and other changes in 2017. There were further updates in late 2018, with revisions to the suspension and the interior, aimed at improving comfort and saving weight. The D-Max majors on tough capability and strong value, and includes a five-year, 125,000-mile warranty as standard. It’s not the most refined vehicle to drive – even in pickup terms – but the D-Max is surprisingly manoeuvrable for such a big vehicle and offers impressive off-road credentials as well. Major rivals include the Mitsubishi L200, Toyota Hilux, Ford Ranger and Nissan Navara, though it’s unlikely to appeal to anyone considering the notably posher – and more expensive – Volkswagen Amarok or Mercedes-Benz X-Class. From launch up until early 2017 the D-Max was powered by a 2.5-litre twin-turbo diesel engine, which produces 163hp and 400Nm of torque. 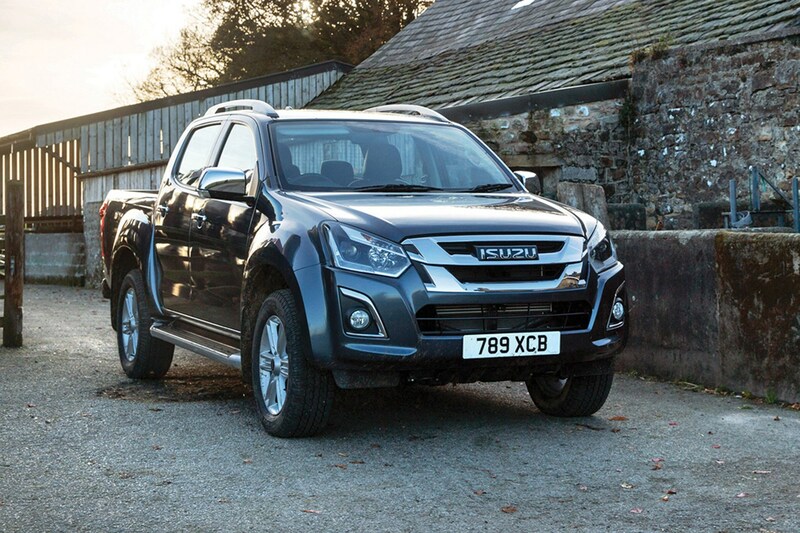 A muscular but rather gruff motor, this excels at towing, as many in the agricultural sector can testify, and enabled the D-Max to become one of the first pickups with a 3.5-tonne (3,500kg) towing rating. In April 2017 a new 1.9-litre turbodiesel engine was introduced as part of an overhaul for the entire D-Max range. This update brought a facelift and revised equipment levels in addition to the new motor, which with 164hp and 360Nm is intended to be quieter and more fuel efficient yet still able to tow that 3.5-tonne max, matching the best in the pickup truck sector. The reduction in torque and engine capacity has still rung alarm bells with some customers, and our experiences with the newer motor are mixed. Both two-wheel drive and four-wheel drive versions of the D-Max are available, depending on trim level. An automatic gearbox is optional on some models. The D-Max is available in three bodystyles – single cab, extended cab and double cab – and is divided into utility and premium trim levels. The utility models are designed as basic working trucks, with reduced creature comforts and agreeably low pricing – this is where you’ll find the single cab and rear-wheel drive only versions. The premium models are split across a number of trim levels, aimed more at lifestyle buyers, and available mostly as double cabs, though you can get extended cab variants for added versatility in some cases. 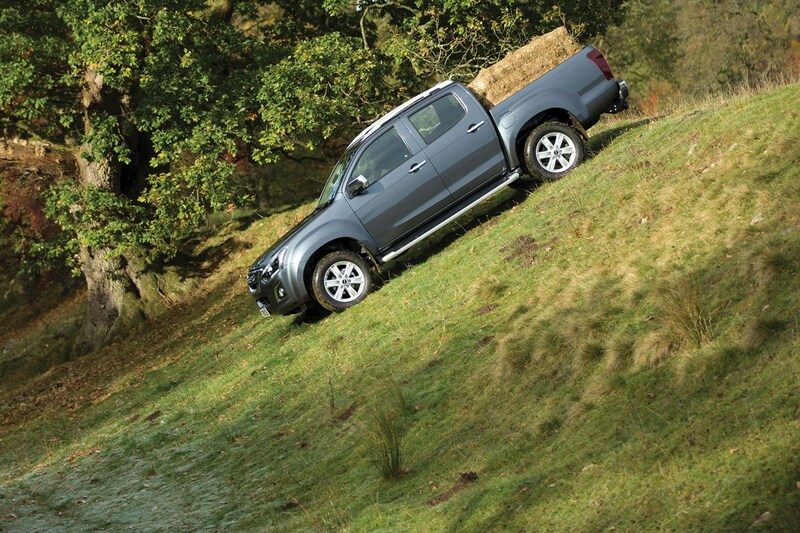 Standard equipment is generous throughout, though often not quite so much as the Mitsubishi L200. Isuzu is fond of special editions, too, and these are worth considering for their added value. A notable example of this is the limited edition Isuzu D-Max AT35, which was first introduced in 2016, and repeated after the facelift in 2017. Built in conjunction with off-road specialist Arctic Trucks, these feature enormous 37-inch tyres, wider bodywork and raised suspension. Introduced late in 2018, Isuzu has made a further round of changes to the D-Max for 2019 - although you're unlikely to spot them from the outside, as there are no modifications to the way it looks this time. Aside from some changes to the paint options. Instead double cab models get a new three-link suspension design at the rear, replacing the older five-link set-up with the aim of improving comfort, reducing noise and saving weight. It certainly does the latter, as payload increases by 10kg across the board. On the inside there are new soft-touch materials and gloss black trimmings; if this is too subtle (and it might be), there's now a D-Max badge on the glovebox to distinguish the newer models as well. All upgraded D-Max also get a new Trailer Sway Control safety system, designed to make towing even easier. The D-Max is a tough truck, ideal for heavy working operations – but the premium versions also polish-up well if you’re looking for a distinctive and capable lifestyle pickup, especially for towing duties. It’s not as nice to drive as some rivals, but it has a charming honesty about it that allows it to function properly as a family vehicle as well as a working one. 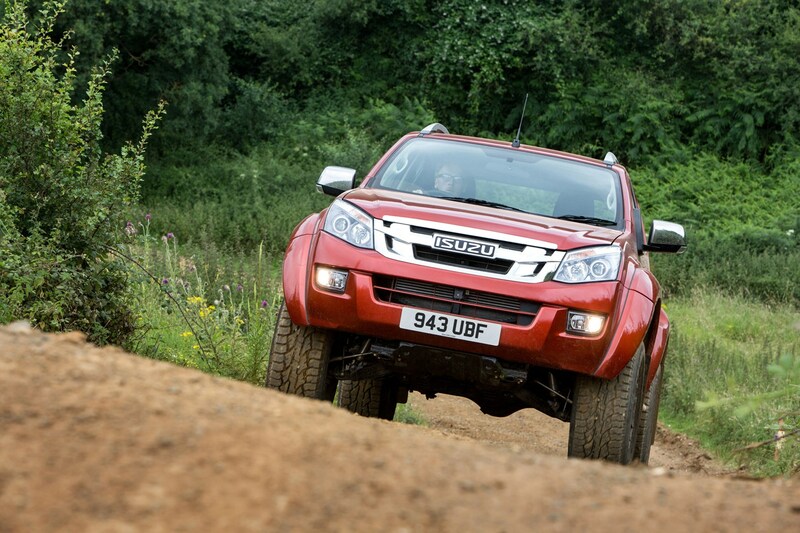 The Isuzu D-Max has always been a gutsy performer. The original 163hp 2.5-litre twin-turbo diesel making up for what it lacked in refinement with a chunky 400Nm of torque, available from just 1,400rpm – more than enough muscle to tow the 3.5 tonnes it’s legally allowed to, and then some. This motor comes paired with a six-speed manual gearbox as standard, while a five-speed automatic is optional. In the manual ’box, first gear is very low, a little like a crawler gear for off-road work, while sixth is very tall to help make motorway driving quieter and more fuel-efficient. As this suggests, the five-speed auto is therefore both less economical and noisier at speed – though you may feel this is worth the sacrifice given the notchy, long-winded shift-action of the manual. Isuzu’s decision to downsize the D-Max to a 1.9-litre diesel engine was met with some concern by working operators used to the existing pickup’s torquey performance. The announcement that the capacity drop also came with a reduction to 360Nm did nothing to reduce these concerns, no matter that it also produced 164hp. The smaller engine is certainly smoother, strong from low revs, and just as capable of towing the 3.5-tonne legal maximum. But while it is more refined than before, it's still not what you'd call quiet. It's certainly not especially fast either, at times feeling decidedly strained. The AT-35 off-road version with its significantly enlarged tyres particularly struggles for performance. Progress isn't always entirely positive. Having said that, the new engine also arrived with new gearboxes: an easier to use six-speed manual as standard ('easier to use' is relative here, it's still not especially nice but definitely better than before) and an efficiency-improved six-speed automatic as an option. Time will tell how the smaller engine fairs in tough working conditions. Regardless of engine, both two-wheel drive (4x2) and four-wheel drive (4x4) versions of the D-Max are available. 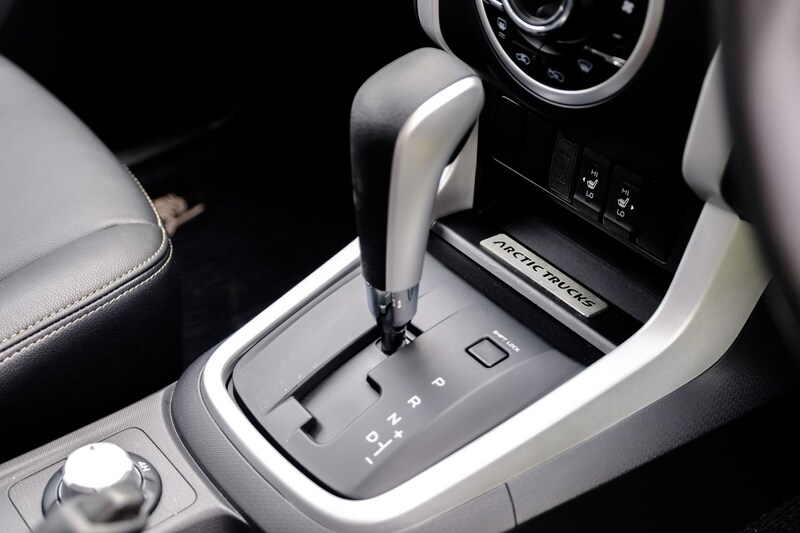 In 4x4 models, a switch near the gearlever enables the driver to change from two- to four-wheel drive mode at speeds of up to 60mph. There’s also a low-range 4x4 mode for off-road use, but you should definitely stop before engaging that one. Best practice is to use two-wheel drive on dry tarmac, as the four-wheel drive system is otherwise liable to ‘wind up’ and wear its gearing out much more quickly; driving only the rear-wheels on-road is far more fuel efficient, too. Using all four wheels gives the D-Max plenty of off-road ability when required, however (more details below). 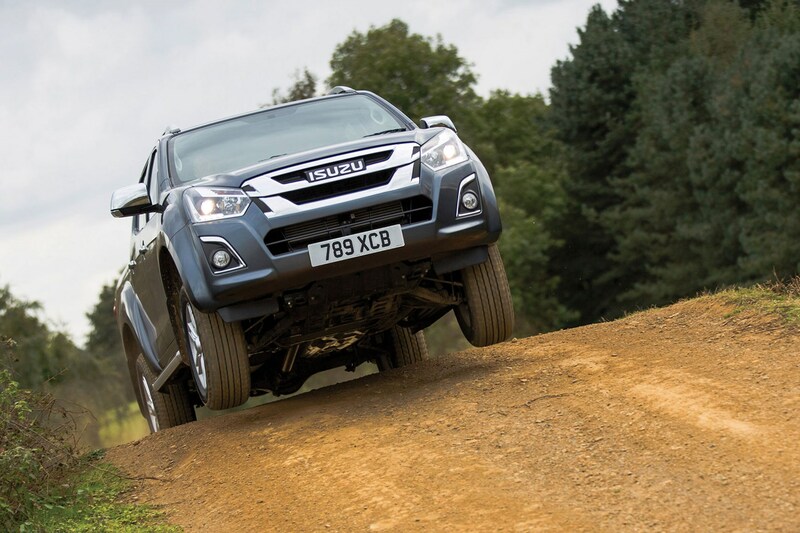 On the road, the D-Max has a rather lurchy ride on its heavy-duty suspension but is otherwise relatively comfortable. Changes for double cab models in late 2018 have improved on this slightly, but this is still far from being as comfortable as a car or passenger SUV. Sound proofing is better than the old Rodeo, but not on a par with the very best in the modern pickup class so the volume quickly ramps up if you’re in a hurry. Body roll is well-contained, but you’ll never be in any doubt you’re driving a pickup. And while the steering is sharp enough to tackle most multi-storey car parks without too much forward planning, faster corners are best taken at moderate speeds unless you really want to alarm your passengers. Considering the D-Max as a potential replacement for an ageing Land Rover Defender? Read on for details of the 1.9-litre engine’s off-road credentials. Is the new 1.9-litre engine an off-road worry? 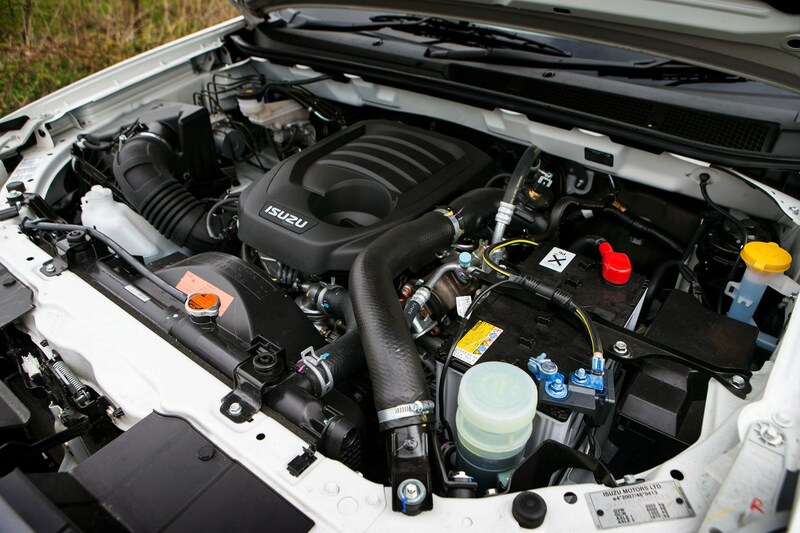 First thing to note is that although the new 164hp 1.9-litre engine is 40Nm down on torque compared with the old 163hp 2.5-litre motor it replaces (producing 360Nm rather than 400Nm), Isuzu has also changed the gearbox. Not only has the old five-speed automatic been swapped for a new six-speed unit as an option, the standard six-speed manual now has different ratios. This has been done to maintain towing performance – both engine variants offer the 3.5-tonne capability, though the 1.9-litre engine combines this with a higher payload – but it helps with off-road work, too. That the smaller engine is also quieter while promising greater fuel efficiency is a further bonus for anyone set to spend hours behind the wheel. Our off-road opportunity in the D-Max came at the Millbrook proving ground, a pseudo-secret test facility in Bedfordshire, with tarmac road areas that are regularly used as television and movie locations, and a series of cross-country tracks and obstacles that are used for developing military vehicles. Not an insignificant challenge, in other words. 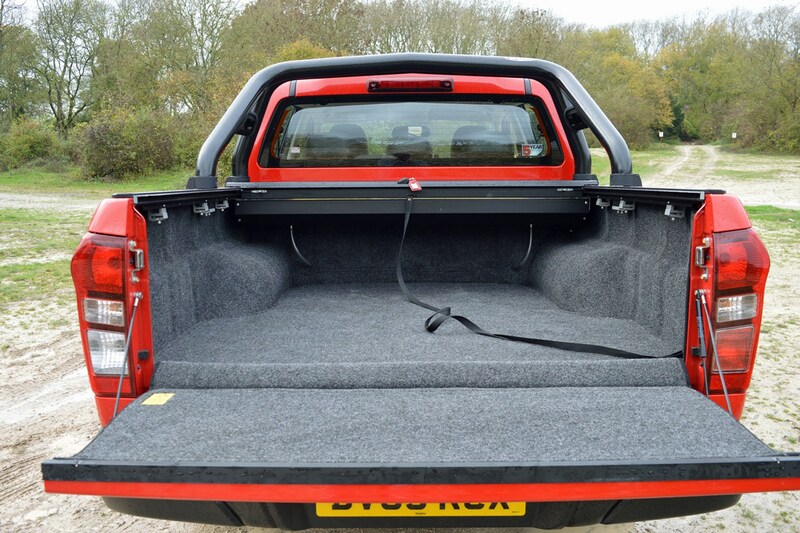 And – for the most part – the D-Max copes admirably. As with most pickups, it has its limitations. Ground clearance varies with model, depending on wheel size and whether side steps or other accessories are fitted. The wheelbase is particularly long – certainly longer than that of even a Defender 110 – which isn’t great for threading through tight trees, and the Land Rover also outdoes the Isuzu for axle articulation, a feature which is useful for maintaining contact with the ground over particularly undulating terrain. This last point is compounded by the relatively unsophisticated nature of the D-Max’s four-wheel drive system; while it may have the option to switch between two- and four-wheel drive high-range on the fly while travelling up to 60mph, it doesn’t distribute torque to individual wheels in a particularly effective manner when the going gets slippery. This means if you’ve got a wheel (or even two) off the ground it can be difficult to achieve enough traction to keep up the momentum necessary to continue travelling forwards. 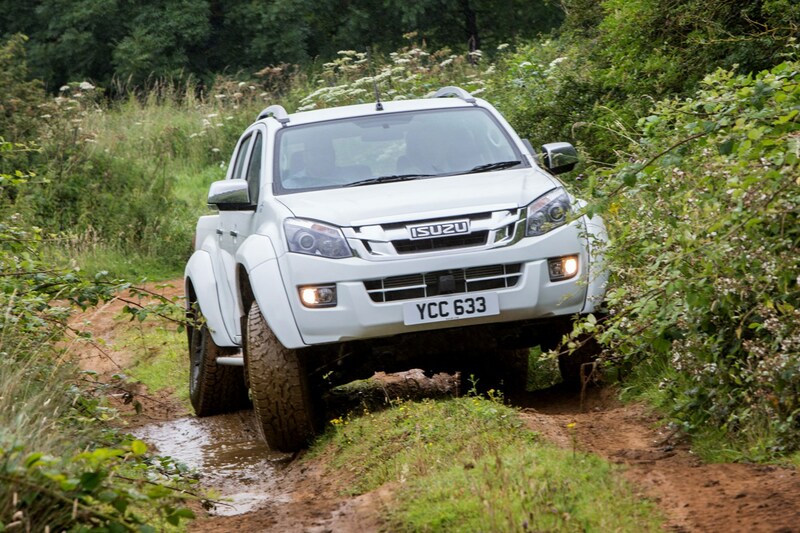 Indeed, there were a couple of occasions where we had to back up to traverse a relatively modest offset bumps obstacle even using the low-range transmission setting – but to be clear, the D-Max was able to overcome them given a bit of a run-up. 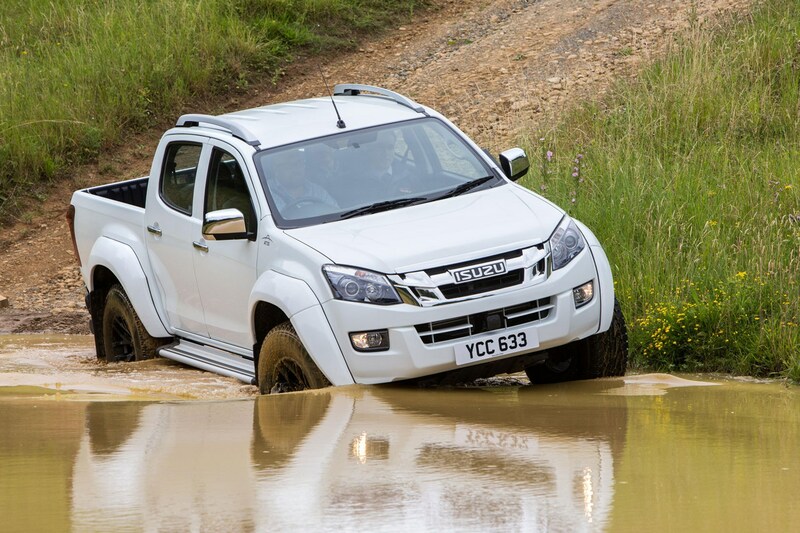 Beyond this minor hiccup, the D-Max showed every sign of being able to cope with the vast majority of off-road challenges operators are likely to experience. And this without a particularly aggressive set of all-terrain tyres, which would be an easy way to make a further improvement. The low-range setting – which gears down the D-Max’s transmission to make better use of the available torque – is activated by electronic control. Although you do have to be fully stationary to engage it (meaning it’s best to plan ahead), this should carry you up most inclines and give you plenty of control when it comes to going back down again. In fact, the D-Max also features a hill-descent control system now – a device that electronically limits and manages your downhill speed – but we found it wasn’t really necessary to engage this. Especially since Isuzu has carried over the anti-stall mechanism from the previous engine. 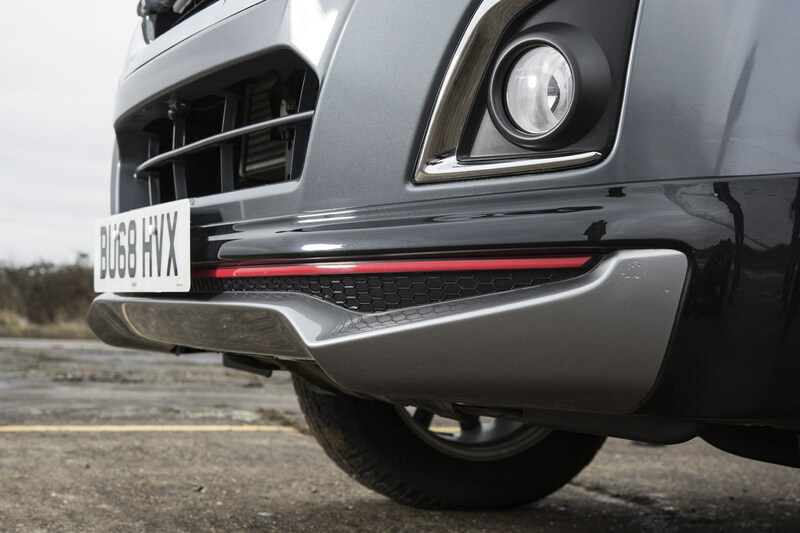 How does the Isuzu D-Max anti-stall system work? It basically does exactly what it says on the tin: it prevents the D-Max from stalling at low revs. But what this actually means is that the truck will keep moving at idle speed – so even if you’ve not got your foot on the accelerator it will plod on forward at walking pace. This is brilliant for slowly negotiating tricky, low-traction climbs, where any over-zealous applications of power and torque risk spinning the wheels and losing grip. The same goes for controlled descents as well. It even allows you to restart the truck in-gear without dipping the clutch – which is handy if you’ve stalled on the side of a hill and popping the clutch in might result in you starting to slide backwards. This is not a new technology – Land Rover owners may well be familiar with it – but it’s certainly a useful asset in off-road situations. While it won’t cope with the most extreme terrain in the way that a carefully driven Land Rover Defender might, any four-wheel drive version of the latest Isuzu D-Max should easily deal with moderate off-road tasks. 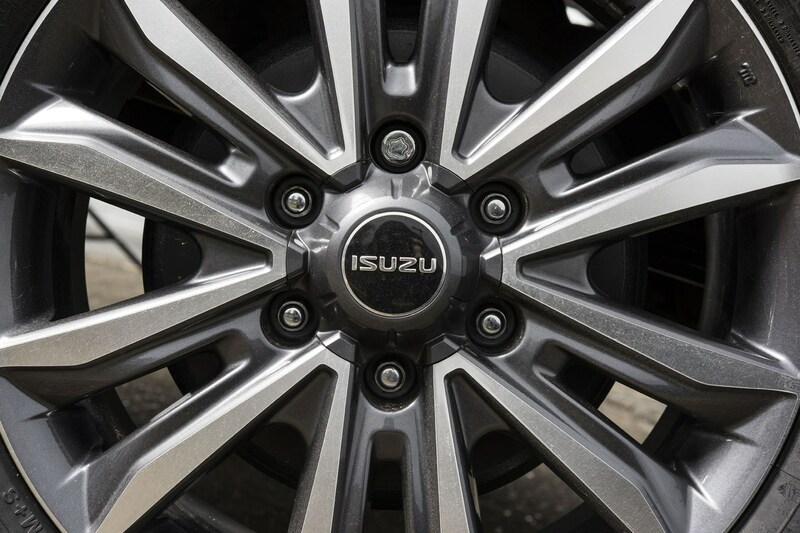 The Isuzu’s length and limited amount of axle articulation are likely to present occasional challenges, but the anti-stall system and the punch from the engine should get you out of other kinds of trouble. So overall the D-Max is well worth investigating. Any other pickups worth considering for off-road work? The current-generation Mitsubishi L200 has also impressed us with its potential as an off-road workhorse, and we’ve had good experiences in the Nissan Navara as well. The Ford Ranger and Toyota Hilux should prove capable as well – though the latter doesn’t have a particularly powerful engine. The VW Amarok V6 certainly does have a powerful engine, but it also has rather limited ground clearance. And not many buyers will want to risk damaging the underside of such an expensive pickup. 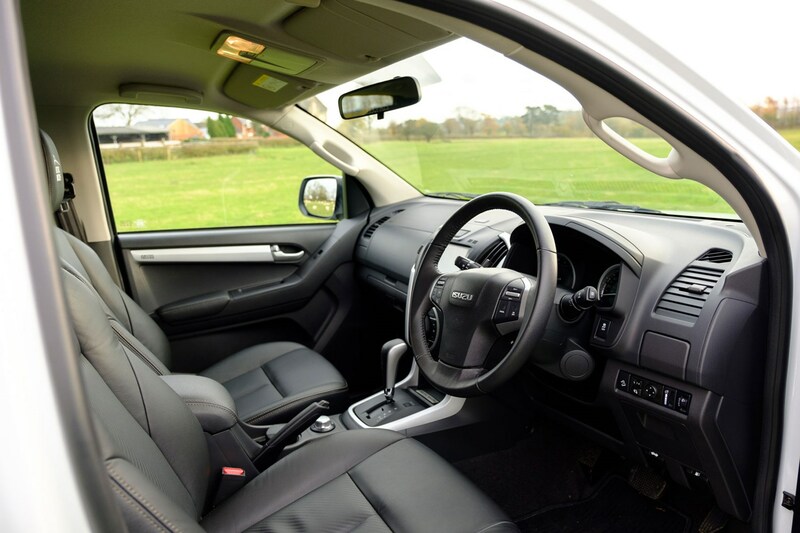 The D-Max cabin is a plain place to be, but since it’s designed to cope with spending much of its time covered in mud that’s not necessarily a bad thing. It’s largely composed of tough plastic surfaces and the floor has an easy-to-clean vinyl covering on Utility models, carpet in more premium offerings. Utility versions aren’t luxurious in terms of kit but there is air-con, electric windows and a CD player. There is a bit more interior space than the old Rodeo, and the doors are longer so it’s easier to climb in and out. As for interior storage, there’s a decent sized cubby box between the seats but storage ahead of the gear lever is poor. You do get twin gloveboxes and some clever slide-out cupholders that double as storage drawers. All models are well equipped with 12v sockets, with later versions adding multiple USB connections. So you should be able to keep all your gear charged without issue. Niggles include a steering column that doesn’t adjust and seats that are rather on the firm side - especially in the rear. Higher-spec premium models are available with touchscreen infotainment systems, including sat-nav. But it wasn't until after the 2017 facelift that top-end versions became fully integrated; prior to this such duties were carried out by a fiddly aftermarket system with small buttons, still offered in lesser versions. The facelift also brought a moderate upgrade in material quality and cabin design - but this version of the D-Max remains a thoroughly practical pickup, rather than a luxury item. Further refinements at the end of 2018 have increased the number of soft-touch surfaces in the cab, however, and there's a new glossy black trim finish that certainly appears more premium. Hardly revolutionary, but it does make a bit of a difference, and the latest D-Max is a slightly nicer place to spend time. 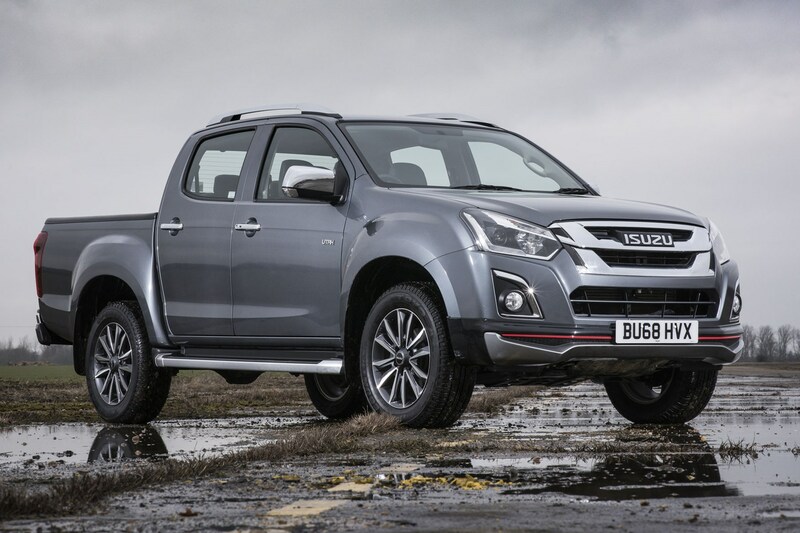 While there isn't a huge choice of different engines, Isuzu does offer the D-Max in a wide range of trim levels, so the chances are there will be a version to suit you. 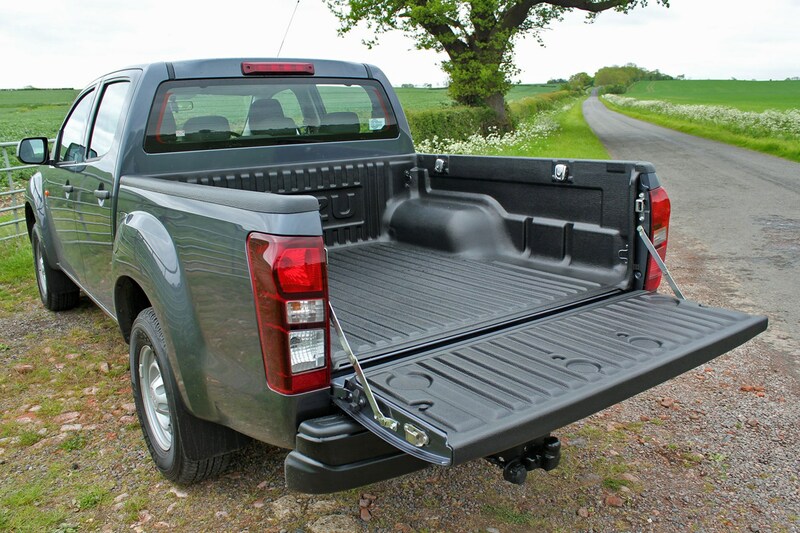 Standard equipment isn't quite as generous as that fitted across the Mitsubishi L200 range, but as a rule the D-Max represents good value for money - especially if you also need a large load area and the option to tow 3.5 tonnes, which the Isuzu is more than comfortable doing. 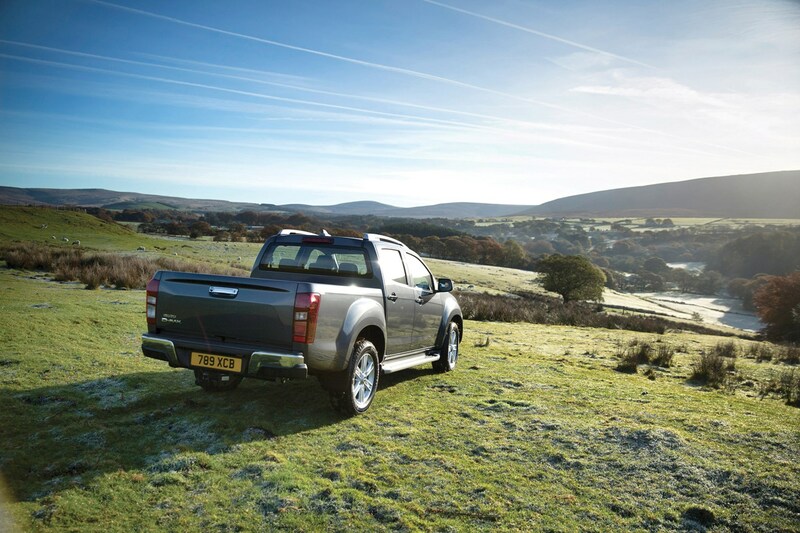 The Isuzu D-Max comes with a five-year, 125,000-mile warranty, which until very recently was the best you could get in a pickup truck sector where most rivals used to only offer three years' of cover. However, the latest SsangYong Musso now comes with a seven-year, 150,000 mile warranty, in addition to its ultra-budget asking price. 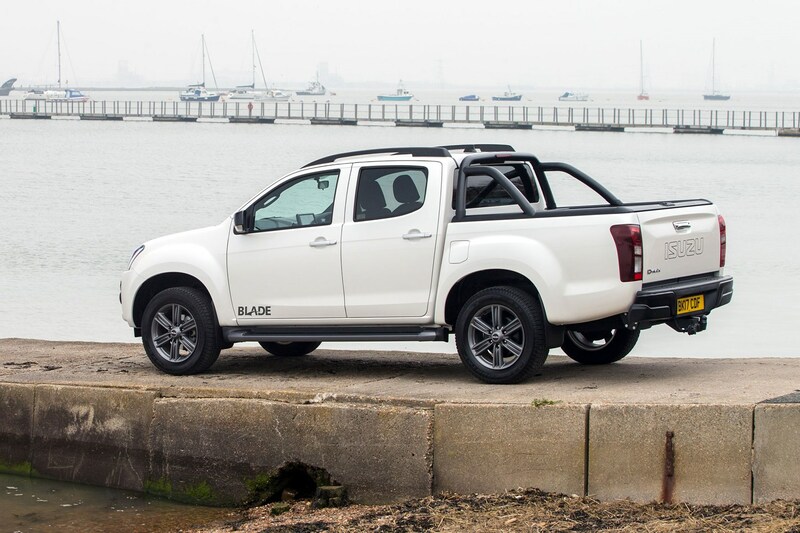 The Nissan Navara and Toyota Hilux also offer five years of cover, but their distance is limited to 100,000 miles. 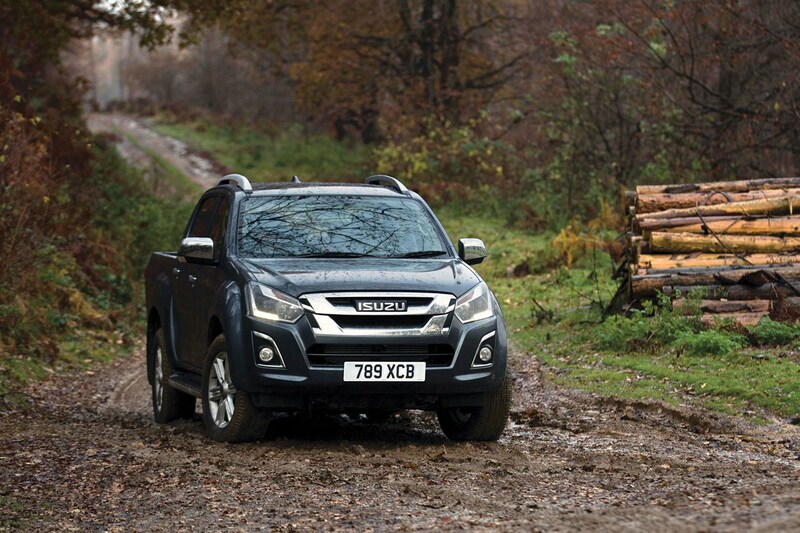 Isuzu D-Max service intervals are set at 12,000 miles or 24 months, whichever is sooner. This is similar to most pickups except the latest Navara, which has 25,000-mile intervals. The introduction of 1.9-litre engine in 2017 has seen official fuel economy improve to 40.4mpg across almost the entire D-Max range - the only exceptions being the two-wheel drive single cab (45.6mpg) and models fitted with the six-speed automatic (36.2mpg). We managed to get over 50mpg out of a four-wheel drive Utility double cab during the 2017 MPG Marthon event, but would typically expect to see more like 35mpg in routine driving. The D-Max meets Euro 6 emissions regulations without using AdBlue, so you're spared the expense of keeping that topped up. As of February 2019, the D-Max comes in one working specification - called Utility - and a selection of 'premium' lifestyle variants: Eiger, Yukon, Utah and Blade. Isuzu is also very fond of special editions, which often feature additional equipment and even unique looks. 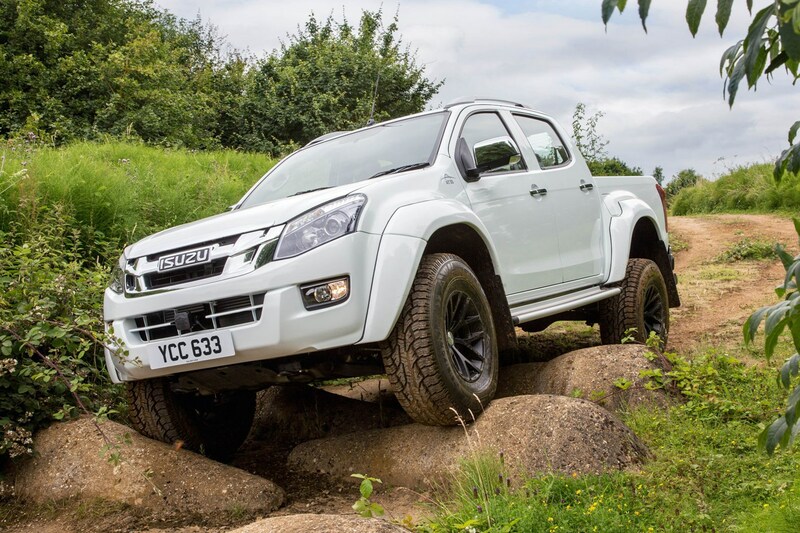 The most extreme version is the Isuzu D-Max Arctic Trucks AT35, but others such as the Fury, V-Cross and Huntsman all offer attractive alternatives to the normal range. We've listed the main standard kit for each standard version below; for detaiils of safety equipment see the Safety and Security section below. The long warranty (five years / 125,000 miles) offers reassurance, and is quite a selling point. Plus there’s also three years recovery and assistance cover, a three-year paint warranty and six-year anti-corrosion cover. Owners typically praise this pickup for its longevity and durability, though as with any hard-working vehicle it hasn't been fault free. More common complaints include diesel particular filters and fuel filters; some have also experienced issues with the differentials and even rust. However, providing you treat it correctly (meanig with even a little bit of mechanical sympathy) we wouldn't anticipate any major problems here. 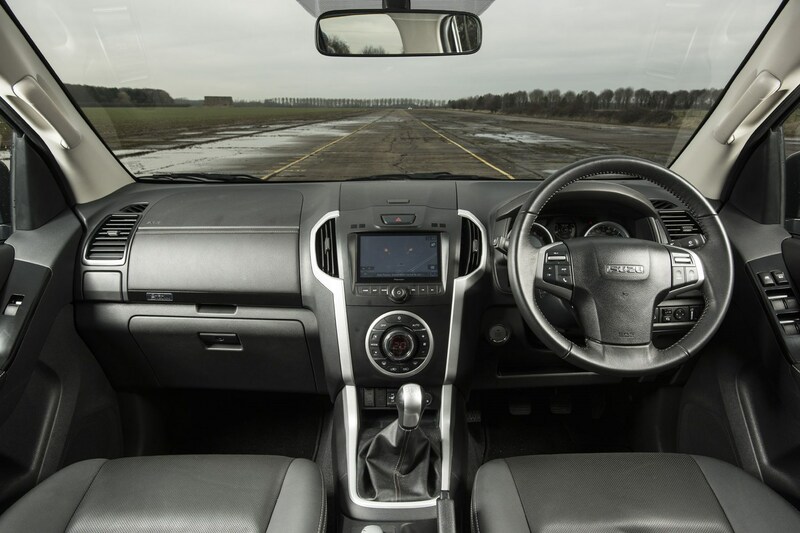 The Isuzu D-Max was crash-tested by Euro NCAP in 2012, and was awarded a four-star rating. Not bad for a pickup, even if the testing regime has been made significantly harder since then. Electronic stability control (ESC) is standard across the range. And good thing, too, since the D-Max can get somewhat tail-happy if driven clumsily in the wet. Six airbags (front, side and curtain) are also standard, as are seat belt pre-tensioners and belt-force limiters in the front. You probably won't be surprised to learn that it doesn't have any of the more modern active safety aids such as autonomous emergency braking we're increasingly coming to expect in cars. However, as of the most recent update, hill-start assist and hill descent control are fitted as standard, while all four-wheel drive versions come with trailer sway control for safer towing. All D-Max models come with an immobiliser and remote central locking, and only the entry-level Utility specification misses out on an alarm. Which Isuzu D-Max is best for me? The D-Max comes in an unusually high number of trim levels for a pickup, though the simplist decision is whether you want a basic working truck or a one that's got a few more bells and whistles. The entry-level Utility specification is the functional working model, making that selection easy. But with a choice of four other 'premium' trims plus numerous special editions, picking a posher model comes down to the kind of kit or appearance you're after, and how much money you're prepared to spend. We've reviewed all of the following Isuzu D-Max models individually, which might help you decide. Isuzu hasn’t been shy of creating special edition D-Max pickup trucks over the years, but this V-Cross variant is one of the more unusual. 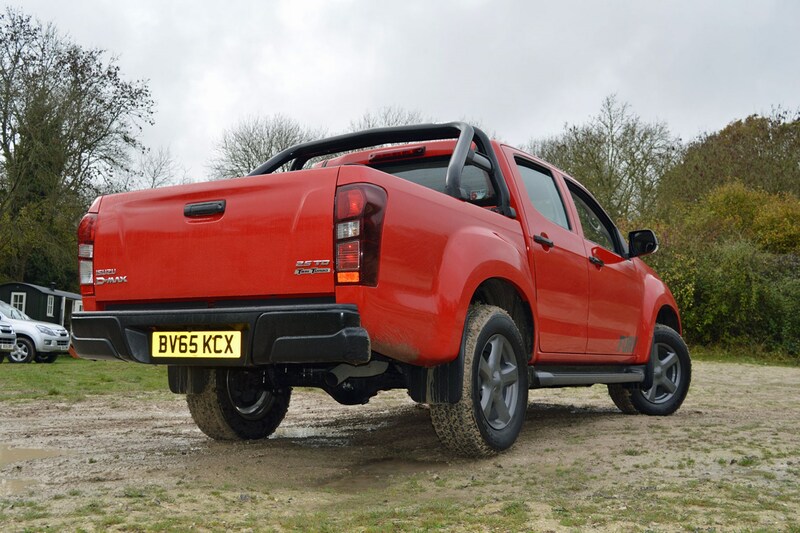 Based on the existing Utah trim level, and limited to 100 examples only in the UK, its most distinctive feature is that curious ‘front skirt’ bumper arrangement – which seems a funny thing to fit to a practical pickup like the D-Max. As regardless of what you think of the way it looks, it certainly isn’t going to help the truck’s off-road performance. Unless you plan to use your D-Max to trim the grass or something. Obviously, it’s not really that low. But with its red stripe detailing hinting of Golf GTI hot hatches, it’s clear this D-Max is firmly aimed at the on-road lifestyle crowd. Our question is whether the D-Max is really a suitable starting point for this kind of machine. Let’s find out. 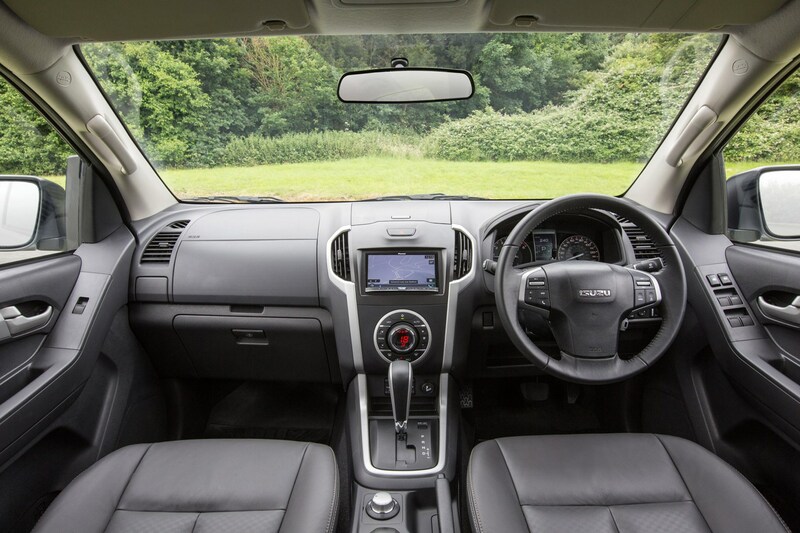 What other extras do you get on the Isuzu D-Max V-Cross? The wheels are an intricate design while the wireless phone charger lurks in the upper glovebox, keeping your compatible phone sensibly out of sight. The forward camera is designed to help with parking; the D-Max is not a small pickup, and this should help avoid nudging unseen objects. 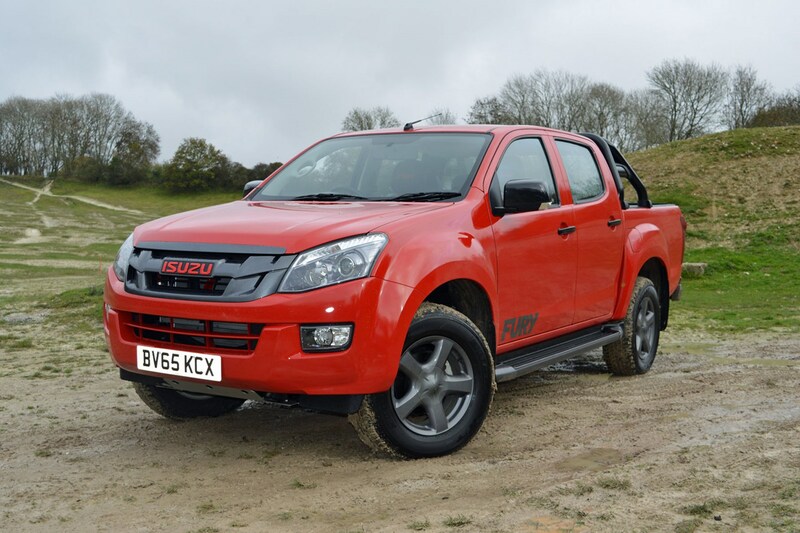 Is the Isuzu D-Max V-Cross good value? You can buy a manual gearbox version for £26,199 or an automatic for £27,199 – which is just £500 more than the standard Utah. Seems a good deal, given the extras. If you like the way it looks. 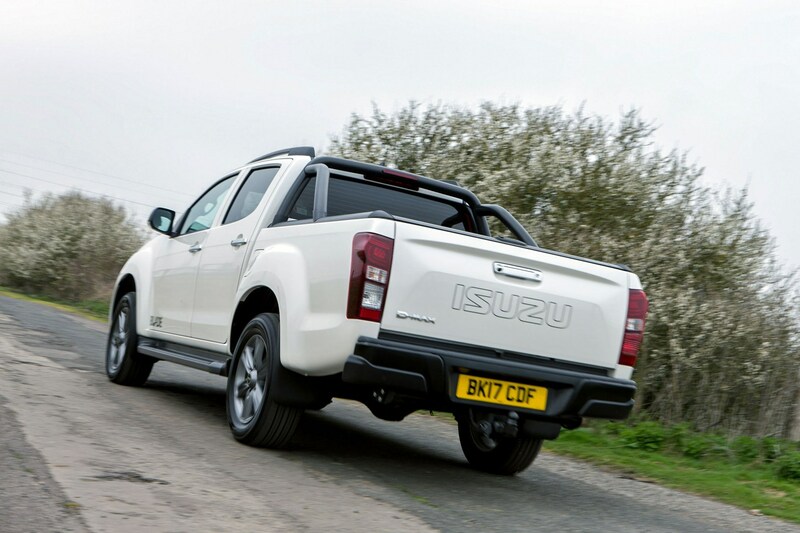 Does the Isuzu D-Max V-Cross work as a lifestyle pickup? The problem we have with the D-Max for lifestyle use is that it’s one of the less pleasant pickups to drive. It’s not absolutely terrible, but the ride is a little crude and uncomfortable, while even the latest version of the six-speed manual gearbox, as fitted to the V-Cross we were testing, has a long and somewhat imprecise shift action. To the point where we found ourselves accidentally selecting first rather than reverse on a number of occasions. Which could be bad news if you’re not paying attention. The D-Max’s latest 1.9-litre engine remains a slightly lacklustre affair as well. While certainly quieter than the 2.5-litre unit it replaced, it’s still noisier than most rivals, and takes some time to get into its stride – making short slip roads an occasionally nervous undertaking. Meanwhile, slow steering and plenty of body roll means fast cornering is best left to the brave – though grip is fine at sensible speeds, the D-Max can become wild enough when given the beans that you’ll be glad of the electronic stability control system. Should I buy an Isuzu D-Max V-Cross? The D-Max’s dynamic shortcomings are less of an issue when it’s being used as a working truck, where the 3.5-tonne towing capacity, generous payload levels and decent off-road performance count for more. The V-Cross is still good value for the extras you get, but it wouldn’t be our first choice for a lifestyle purchase – although if you need to tow a boat or a horsebox (or whatever) and like the way that front skirt looks, then it will happily do the job. Does the kit add to the capability? There’s an undeniable appeal to Isuzu’s D-Max pickup after it’s been given an Icelandic twist. Equipped with 35-inch tyres and given wide arches and a suspension lift to accommodate, the AT35 offers a pre-packaged approach to serious off-roading with a manufacturer seal of approval. In Britain, this puts the AT35 in good stead for farmers and builders tackling particularly rough tracks and environments. It’s likely, however, that the Arctic Trucks’ aesthetic will appeal just as much to the kind of drivers who choose extreme variants of SUVs; it's aggressive, eye-catching and intimidating. 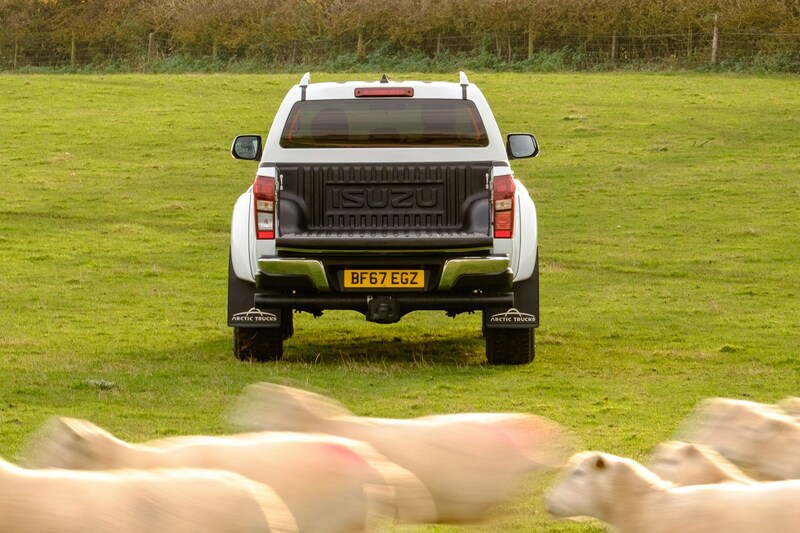 The D-Max hasn’t captured the attention of the lifestyle pickup driver in quite the same way that the Nissan Navara, Ford Ranger and Mitsubishi L200 have, but in rural communities you’ll spot a fair number of the rugged trucks. A short rear overhang makes it easy to manoeuvre, and a relatively squared-off cab with good visibility helps too; the large infotainment system also includes a reversing camera - the lens nearly integrated into the tailgate handle. 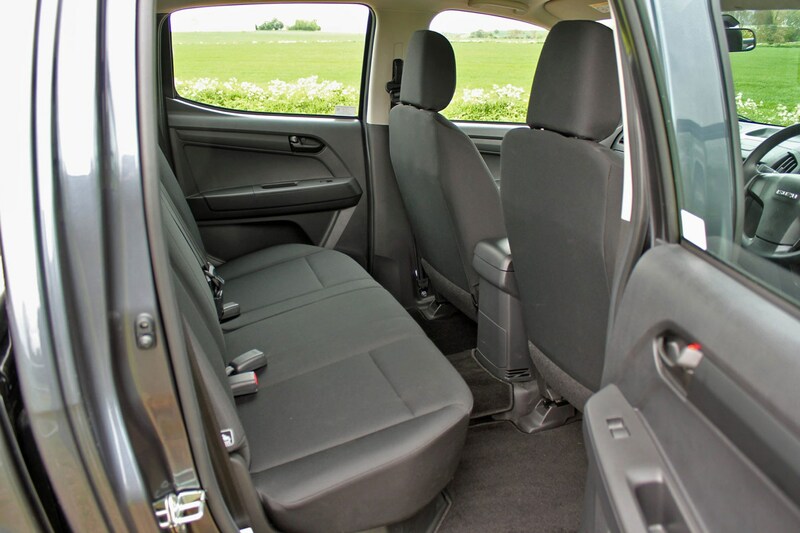 Inside, the D-Max is designed for work. Heavy, solid plastics dominate, with functionally attractive styling and a legible instrument pack that includes a pleasingly modern information display. Arctic Trucks logos feature on the leather-trimmed front seats and rather crudely applied as decals on the aluminium-style door trim. The distinctive Isuzu heater control, with bold digital display and glove-friendly control ring, emphasises the ‘built for boots and gloves’ ruggedness. 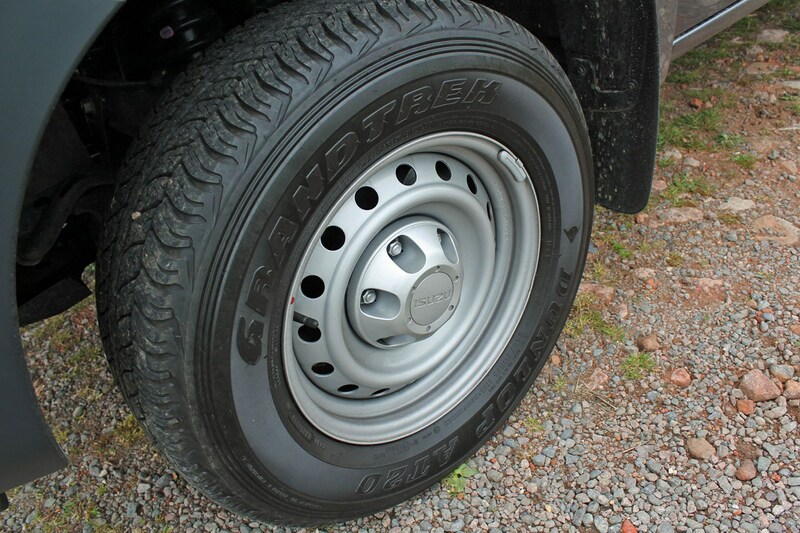 Increased ride height, ground clearance and contact area for those grippy tyres give it an advantage off-road. Nothing has been altered over the standard D-Max running gear, with the primary 2WD mode providing rear-wheel drive for on-road use. Part-time four-wheel drive - without a centre differential - features for off-road use and tricky conditions. It can be shifted on the fly at up to 60mph with a rotary selector, and more challenging scenarios such as towing on loose surfaces are accommodated with the low-range 4x4 mode. In the latest generation of D-Max, the 2.5-litre four cylinder diesel and five-speed automatic have been replaced with a 1.9-litre engine producing 161hp at 3,600rpm and 360Nm between 2,000 and 2,500rpm, paired to a six-speed auto. In the AT35, the loss of 40Nm of torque is simply impossible to ignore, as the six-speed auto hunts around to stay within an incredibly narrow band of power and efficiency. Fighting the extra bulk and rolling resistance of those signature wheels, the 1.9-litre reveals just how much of a compromise it must be to deliver the required cleanliness. We found no payback in terms of economy, either, as at motorway speeds and in regular mixed driving the economy is far from the claimed 40.4mpg combined figure. During our review it failed to deliver a figure starting with three, let alone four. 27mpg is fair, but achievable by vehicles with larger and more powerful Euro 6 engines and similar weight. All of this means that any lifestyle buyer tempted by the AT35’s boastful branding will soon be frustrated. Only the slowest A-road dawdlers will be scared by the imposing front, and Navaras and Rangers will sail past effortlessly on the motorway. In the carpark or feed store, the height of the pleasingly-damped tailgate is also a hindrance. Static, with the cupholders in the loadbed and some friends for a tailgate BBQ, it looks fantastic, though. Worse still, the lack of torque will inevitably impact the ability to tow. Despite being rated to tow 3.5 tonnes (and carry another tonne), given the meal it makes of hauling its own 2,061kg bulk around, adding extra weight is hardly going to improve matters. Should I buy an Isuzu D-Max AT35 with the 1.9-litre engine? Ultimately the AT35 is – for the UK’s typical lifestyle pickup buyer – just too specialised and focused as an off-road tool, and insufficiently capable on-road given the competition at this price level. 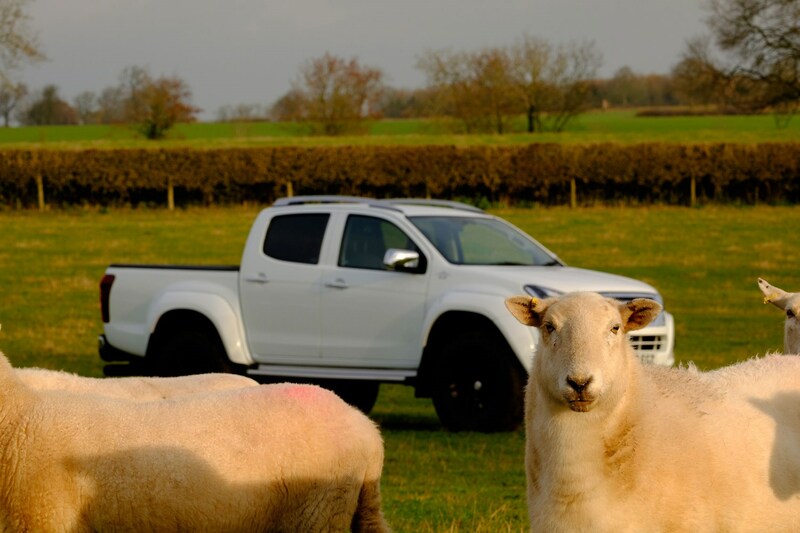 Nearly all of the shortcomings can be blamed on that engine; Isuzu have produced a real sheep in wolf’s clothing. Isuzu has updated its D-Max pickup, with the changes including a new 164hp 1.9-litre engine. Our first test of this 2017 D-Max facelift came with a review of the range-topping Blade lifestyle model, complete with equally new six-speed automatic transmission. 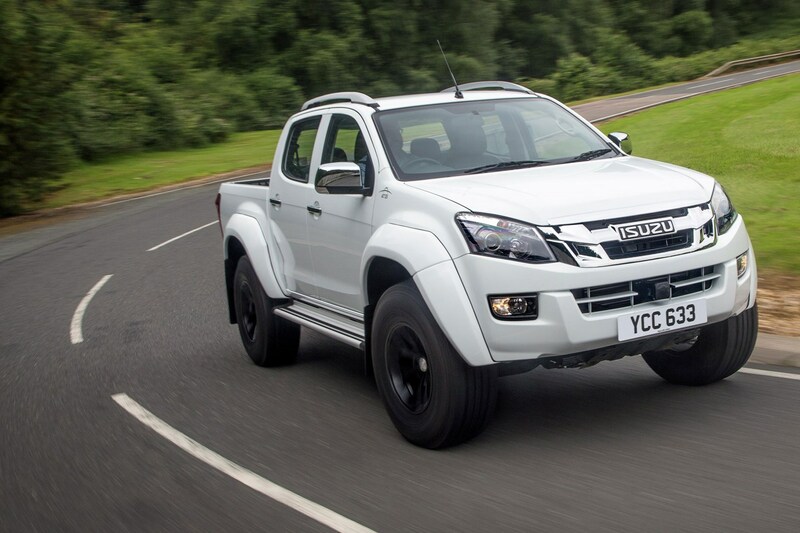 This time, however, we’re trying out the polar opposite – a basic D-Max Utility model with the standard six-speed manual gearbox, a pickup built to be a functional workhorse. It keeps the five-year, 125,000-mile warranty that helps make the D-Max such good value, but it definitely favours function over thrills. Just how basic is the D-Max Utility? The steel wheels and unpainted bumpers tell the story immediately – this D-Max isn’t designed for looking good in B&Q’s car park, but actually getting stuff done. 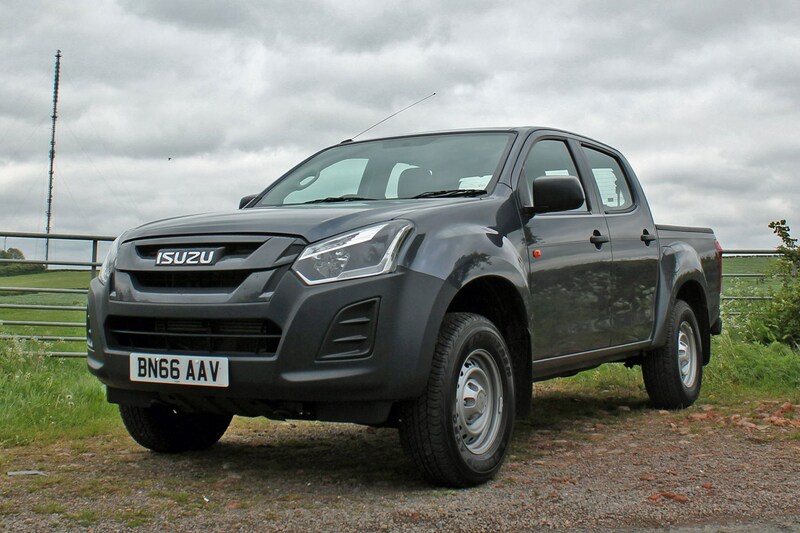 Tested here as a double cab, however, it still has four doors, seating for five and four-wheel drive, which means it counts as a ‘dual-purpose’ vehicle and can legally travel at higher speed limits than the true entry-level single cab, rear-wheel drive D-Max Utility. It’s got twin Isofix child seat mountings and child locks for the rear doors. So it can serve as a practical family vehicle, too. However, compared to fancier D-Max models (and the rival Mitsubishi L200 4Life) you miss out on things like steering-wheel mounted audio controls. Interior quality seems well up to the task, although we do wish the steering wheel offered more adjustment, and the Utility doesn’t get as much soft-touch padding as other versions. What’s the facelifted D-Max Utility like to drive? The all-new engine is definitely less noisy. Replacing the previous 2.5-litre twin-turbo motor with a 1.9-litre variable geometry single-turbo is actually a bit of a bold move when one of your major selling points is a reputation for immense towing ability – the older D-Max is legendary for being capable well-beyond its 3.5-tonne road legal limit. This new one may be slightly up on power – with a hardly quantifiable single extra horsepower on the spec sheet – but it’s 40Nm down when it comes to the all-important load-lugging torque, producing 360Nm 2,000-2,5000rpm instead of 400Nm. 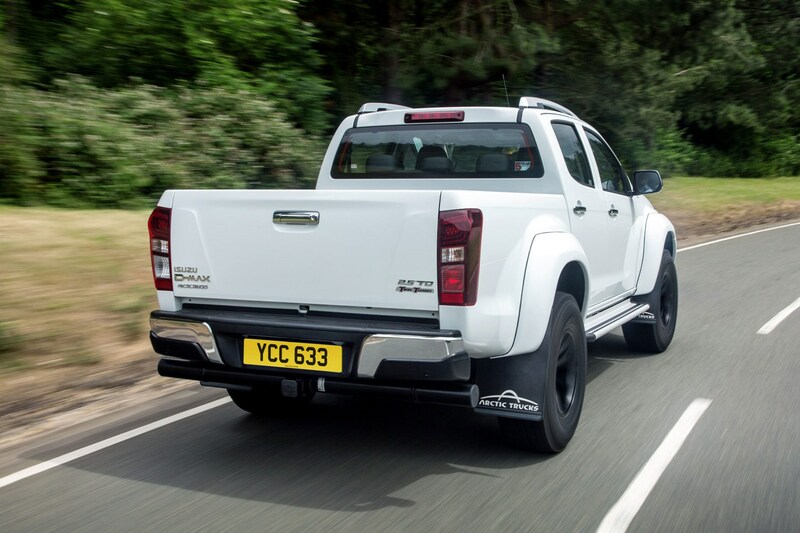 There are much stronger-engined pickups available now – the posh VW Amarok V6 tops the lot with as much as 550Nm, for example – so if towing is a major part of your business needs, do make sure you test this in the D-Max before signing your life away. It is still rated to 3.5-tonnes, but the stats don't always tell the full story. In all other respects the new engine is an improvement. A bit of diesel rattle perseveres at low speeds, especially from cold. But once warmed up, response to your right-foot is more immediate, vibration in the cab is reduced and the D-Max is now markedly more hushed at motorway cruising speeds. And while the suspension – especially in this tough Utility version – remains very bouncy unless you’ve loaded it enough to take up some of the tension in the rear springs, the D-Max maintains the impressive manoeuvrability it’s always had. Car parks hold little fear for this truck. 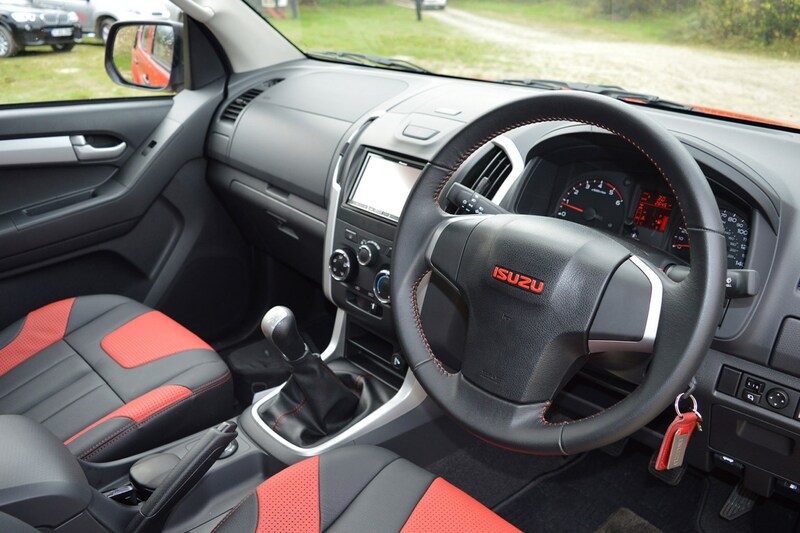 Should I buy an Isuzu D-Max Utility with the 1.9-litre engine? Though the downsized engine continues to raise eyebrows, overall the D-Max Utility continues to be a working truck we can fully recommend. 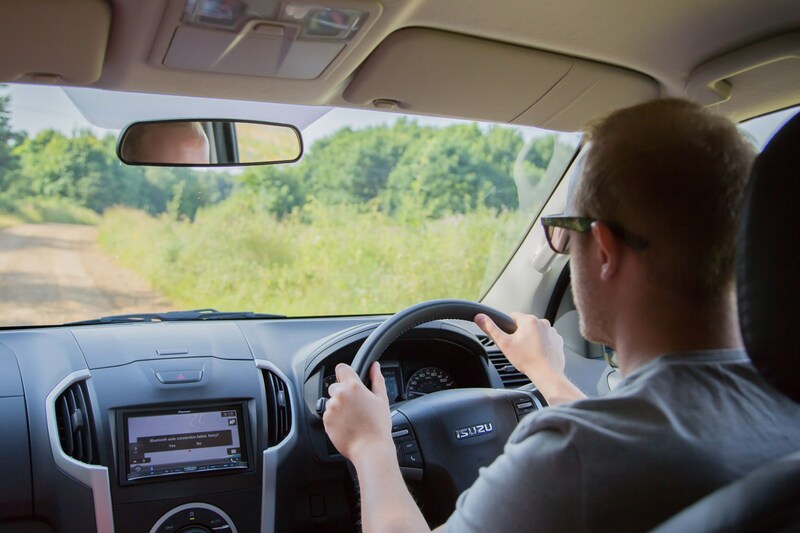 The driving experience isn’t the most sophisticated, and you’ll want to bin that standard stereo almost immediately, but the all-round capability and that excellent warranty make for great value. 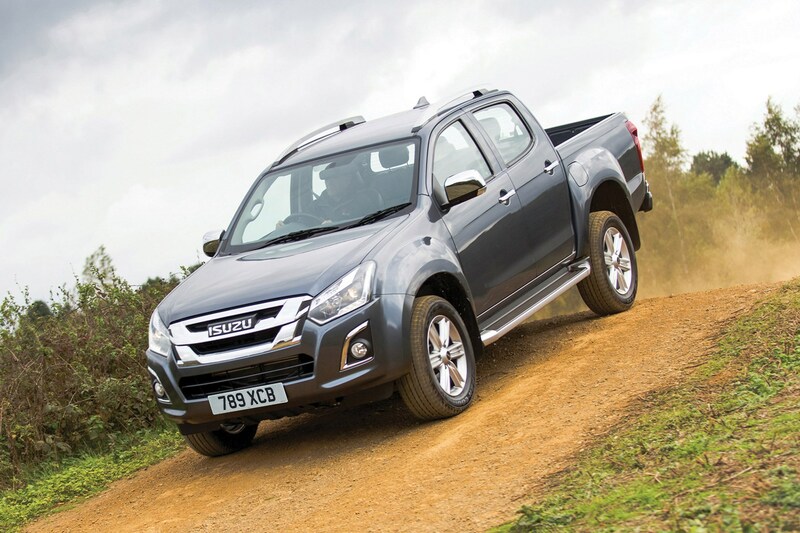 The D-Max – Isuzu’s tough-as-nails pickup – is known for its utilitarian nature and 3.5-tonne towing capacity. However, in a bid to boost its economy and lower CO2 emissions, a new 1.9-litre turbodiesel has been dropped into the engine bay, replacing the old 2.5-litre twin-turbo unit. Here we test it in range-topping Blade trim. What most D-Max buyers will want to know is whether it's retained its 1.0-tonne payload and 3.5-tonne towing capacity in the switch to a smaller engine, and you'll be pleased to hear that it has. Producing 164hp and 360Nm of torque (40Nm less than the 2.5-litre), this particular version of the D-Max is now able to take 26kg more weight in the back as the engine itself weighs less than before. 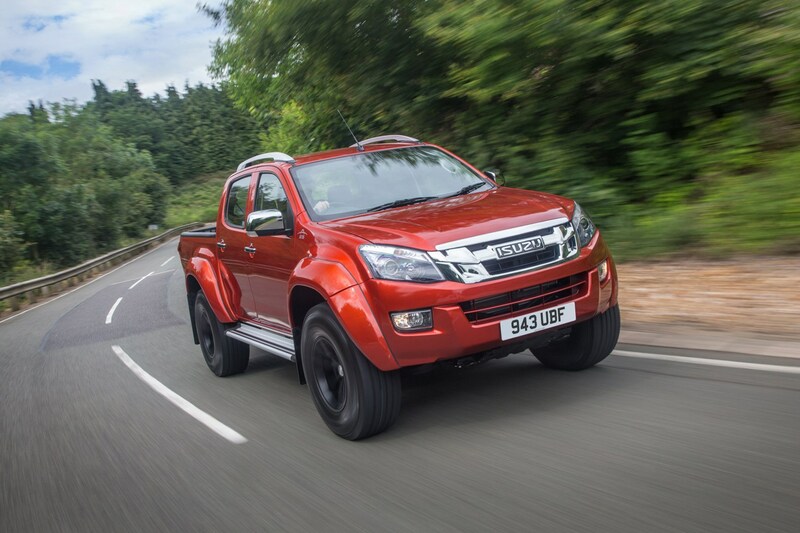 Other variants across the D-Max range have gained up to 154kg in payload limit. It’s not just under the bonnet where the D-Max has been updated. The styling has been tweaked with new lights and bumpers front and rear, and the interior has received a spruce up too. On the whole it’s a familiar, hard-wearing design, but higher-end models receive new infotainment systems, with this Blade debuting a huge 9.0-inch touchscreen, which pokes out of the dashboard, plus a healthy list of standard equipment for the £26,999 plus VAT price tag (at the time of writing). The size of the loadbed remains the same as before, so it’s 1,485mm long by 1,530mm wide, and the Blade comes with a remote-lockable tailgate and the option of either a roller cover or a full-on Aeroklas canopy. You’re able to carry up to 1,101kg in the back and it’ll still tow 3.5 tonnes which is a huge bonus for those looking to upgrade to this version from the older truck. We towed a trailer with another D-Max on it, and it coped very well indeed. In truth, it feels very similar to the older 2.5-litre D-Max in terms of performance. The new 1.9-litre unit produces a slightly higher 164hp and feels punchy, while the new six-speed automatic transmission adds an extra ratio. This will hunt around for the right gear if you floor the throttle or if you’re driving uphill, with some time taken to change down if necessary, but at least the gear changes themselves are smoothly done. 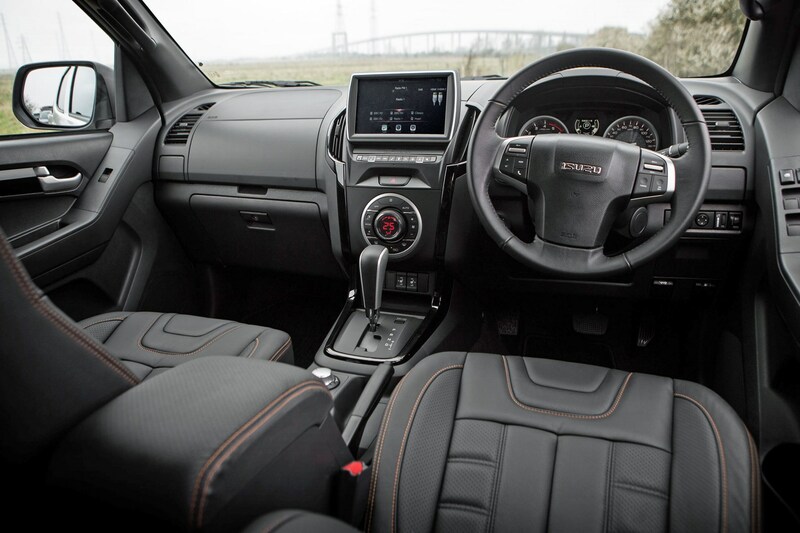 Isuzu claims the D-Max’s refinement is improved, too, but it remains quite a noisy engine under hard acceleration, with some vibrations making their way through to the cabin. More than they would in something like a Nissan Navara. At cruising speeds and around town, it’s not intrusive though, and it's surprisingly at home sitting on the motorway. 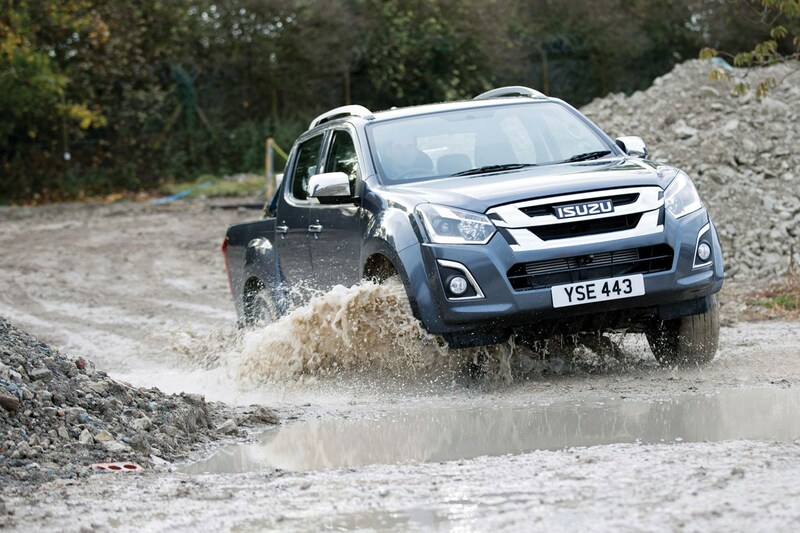 But the D-Max can become unsettled by harsh road surfaces which takes the shine off the driving experience. Still it’s impressively capable in the rough stuff, too – living up to its rufty tufty reputation thanks to a selectable four-wheel drive system and new features including Hill Assist and Hill Descent Control. 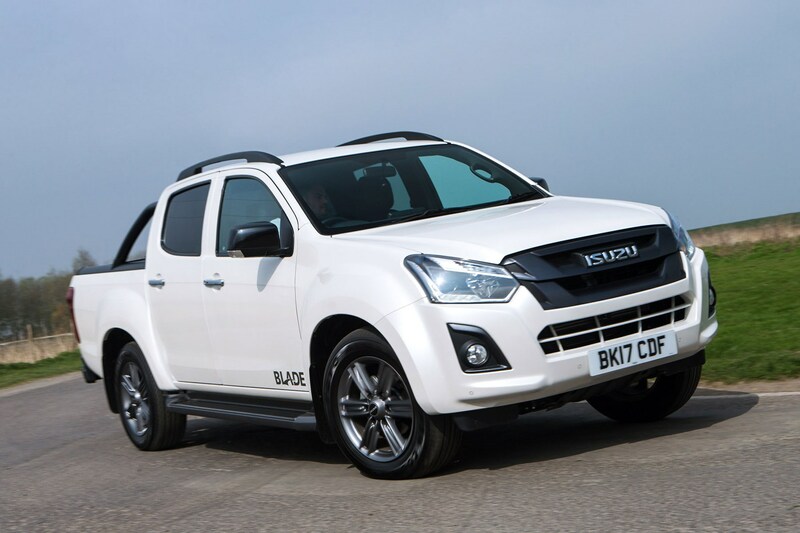 Should I buy an Isuzu D-Max Blade with the 1.9-litre engine? 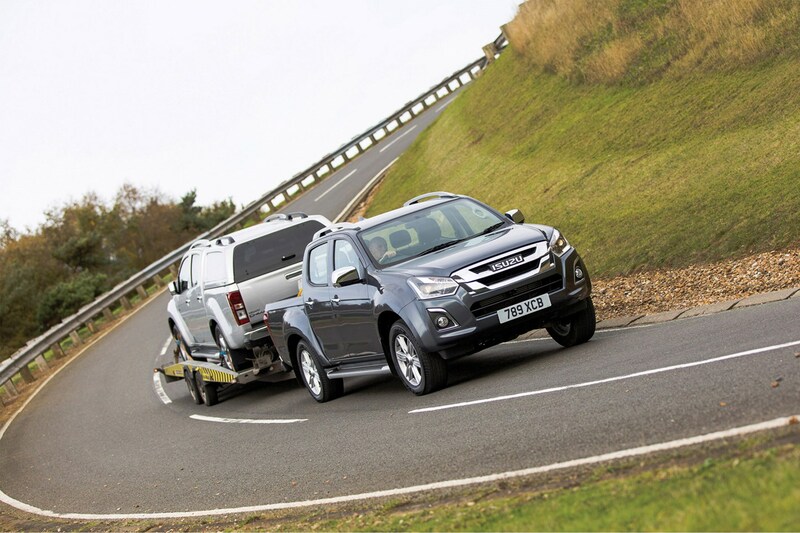 Isuzu has retained the D-Max’s main selling points of impressive towing capacity and payload, utilitarian usability and strong value, by keeping things simple. The more extensive kit list is welcome in making it a more user-friendly pickup day-to-day, while the new engine is still as punchy and capable as ever, but with some useful efficiency benefits off the back of it. Go-anywhere ability, but is it worth the £30k+ price tag? 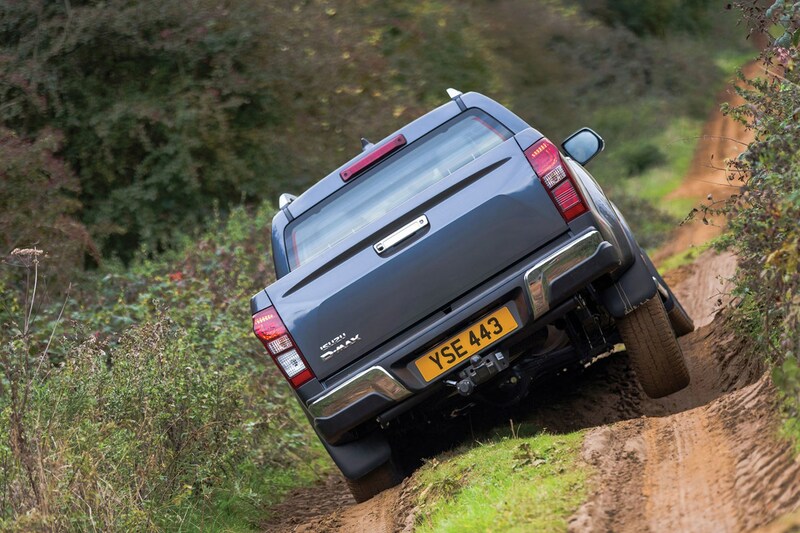 If you need a pickup that’ll tackle more than just a steep slope or some muddy tracks, Isuzu has the answer. It’s teamed up with Icelandic off-road experts Arctic Trucks to create the D-Max AT35, a £31k beast that’s been given some comprehensive upgrades if you work near (or on) a mountain. 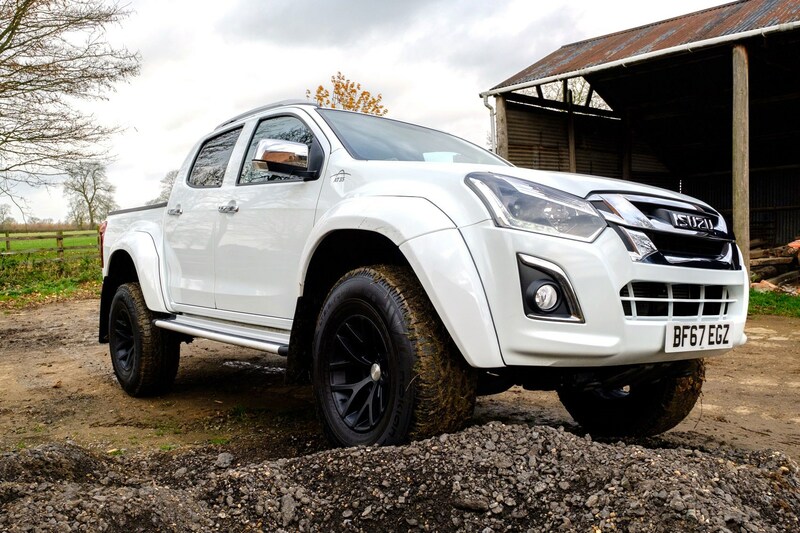 The Arctic Trucks makeover means the D-Max has been treated to some aesthetic and mechanical upgrades, including beefed-up bumpers and wheelarch extensions and a set of hefty 35-inch tyres. It’s under the skin where the clever people from Iceland have fettled most, though. Using expertise from 25 years’ experience in adapting pickups for harsh Arctic and Scandinavian conditions, the D-Max gets re-engineered suspension with Fox Performance Series dampers and 125mm of extra ground clearance compared with the regular D-Max. 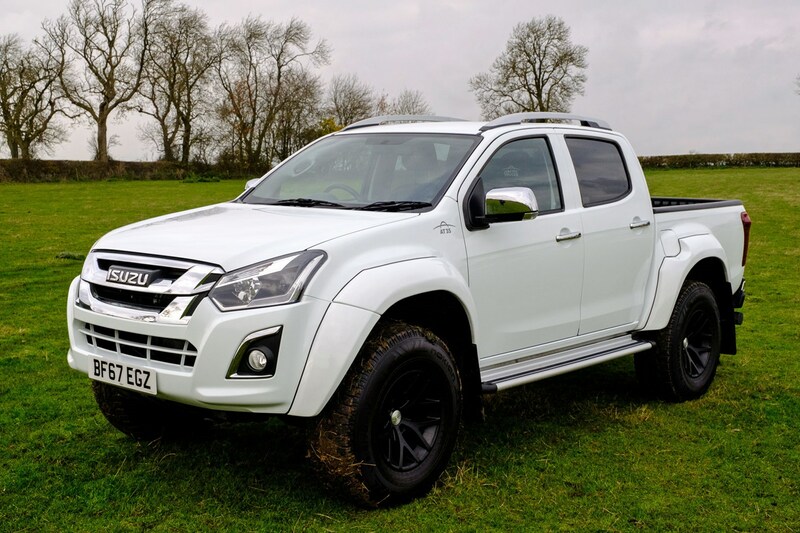 The AT35 is based on the D-Max Utah, available in extended cab and double cab body styles, and comes with plenty of equipment as standard, which is good when you consider it costs from £30,999. The usual 2.5-litre twin-turbo diesel remains, producing 163hp and 400Nm of torque, and there’s a choice of six-speed manual or five-speed automatics, depending on the bodystyle. The D-Max is still capable of towing 3.5 tonnes and carrying a 1-tonne payload too, so the rugged enhancements haven’t compromised its versatility. Manual and automatic gearbox versions are available. What you really want to know is how good it is in the rough stuff. And the short answer is: very. We tried the D-Max out on some pretty challenging terrain and it barely broke a sweat, which is a tribute to the work Arctic Trucks has put into the AT35 – it felt unstoppable. 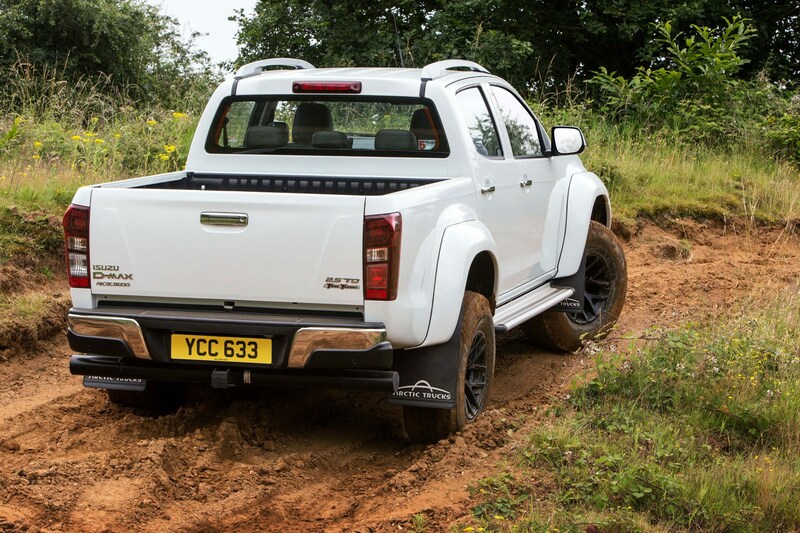 There’s an overwhelming sense that it’ll keep on going long after other pickups and off-roaders would have got stuck. There’s no fancy electronic trickery like hill-descent control either, just flick it between high and low-ranges for the gearbox. On the road - where the AT35 will spend most of its time - it certainly has presence. 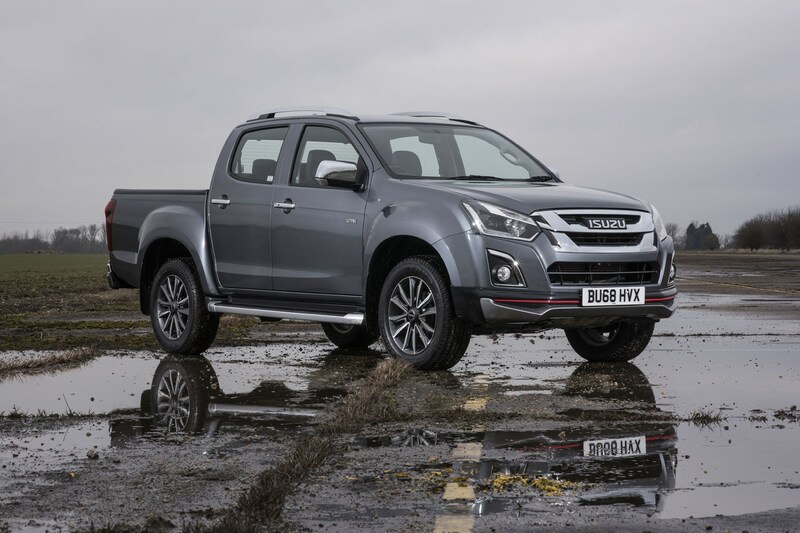 But the increase in track and ride height make it feel more cumbersome than the regular D-Max – on tight roads the bouncy ride and wide body are noticeable – although oncoming traffic will move out of your way. The engine remains pretty noisy especially under full throttle, but it gets up to speed in decent time and those big tyres don’t create as much noise as you’d expect. They do make the D-Max feel quite wallowy though, but a rugged pickup is never going to be the first choice for a spirited drive on a twisty road. Should I buy an Isuzu D-Max AT35 with the 2.5-litre engine? The D-Max AT35 is the first Arctic Trucks pickup to be available through Isuzu's 36-strong main dealer network in the UK, and the enhancements won’t be available to retrofit to existing models – each one will be built to order. It’s got great presence and off-road ability, plus the on-road experience hasn’t been compromised too much, but it’s more likely to appeal to someone who will use it as an expensive recreational toy as opposed to a go-anywhere workhorse like in Scandinavia. 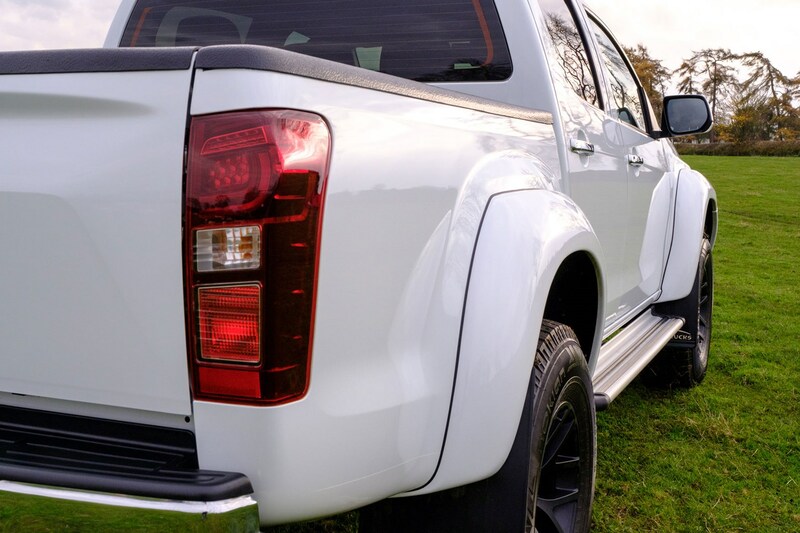 Best looking of all Isuzu D-Max trims? Fancy looking the part without spending the money? 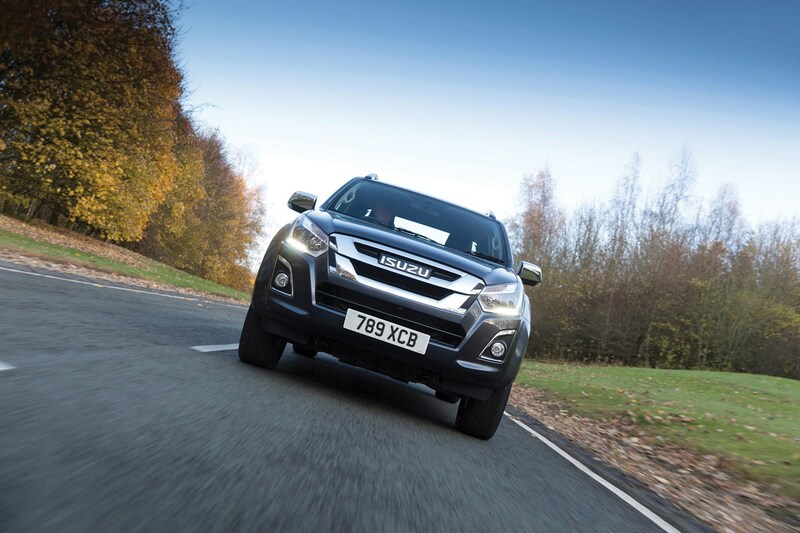 Isuzu may just have the solution in the form of the £19,999 (at time of writing) Isuzu D-Max Fury. Unique to the Fury-spec is the striking Magma-red paintwork and ‘Isuzu’ badge, and gun-metal grey grille, sidesteps and 17-inch alloy wheels with 255/65 R17 Pirelli Scorpion tyres. 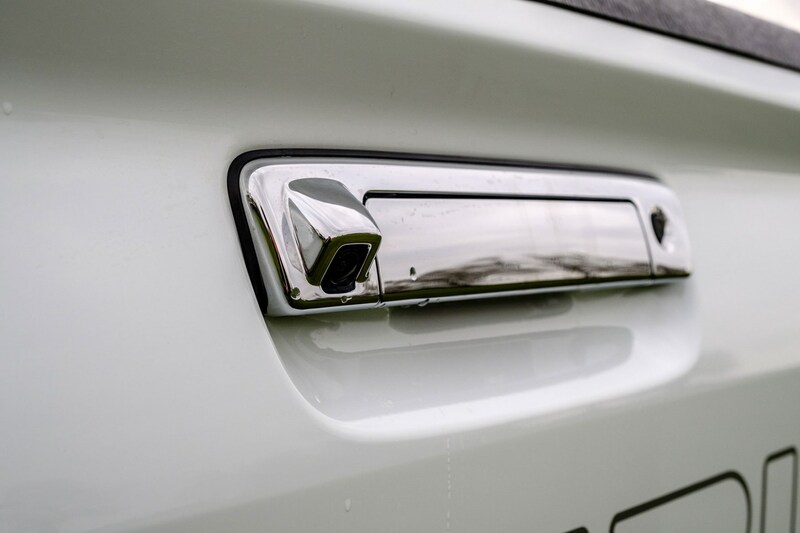 The wing mirrors, door and tailgate handles, and rear bumper have been coloured in a glossy back. Even the interior has been given a distinctive edge with red stitching on the steering wheel and gear knob, and Fury-labelled carpet mats. Black and red leather seats are optional. 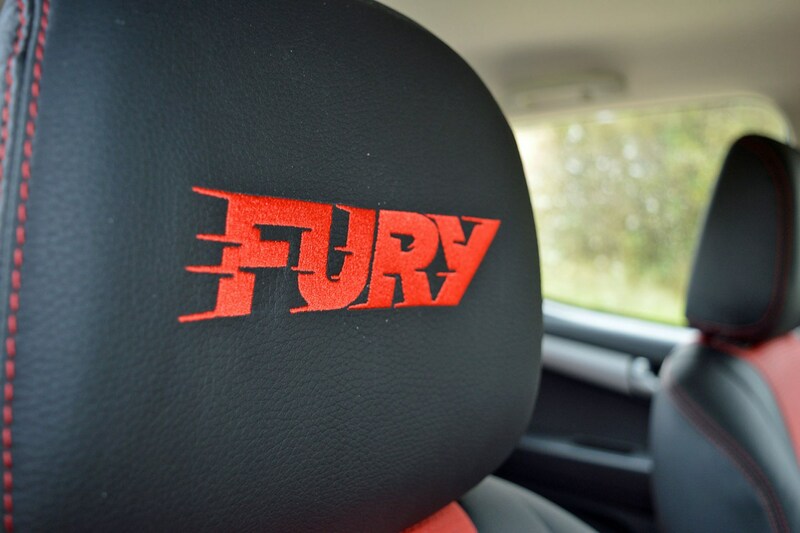 However, there are a number of key features missing from the spec sheet, which explains how the Fury is so affordable, including electrically adjustable seats, electric mirrors and cruise control. 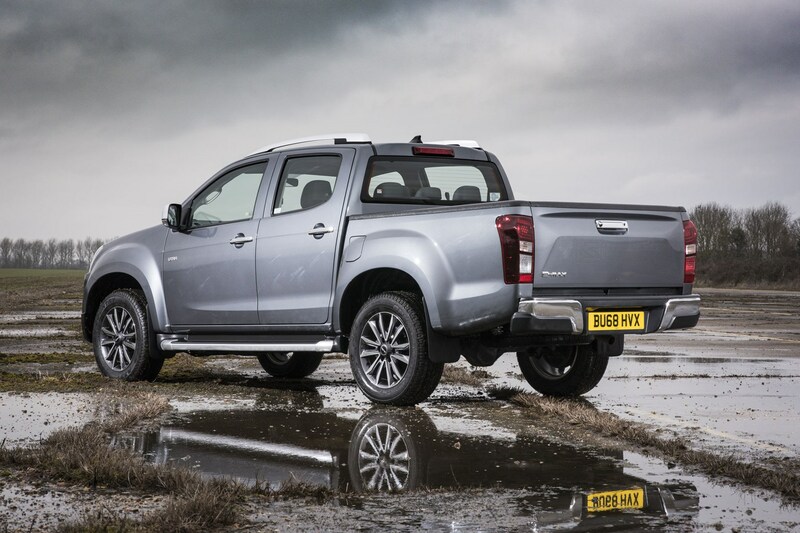 Even with the extra kit, the Isuzu D-Max Fury still offers a respectable payload of 1,072kg. 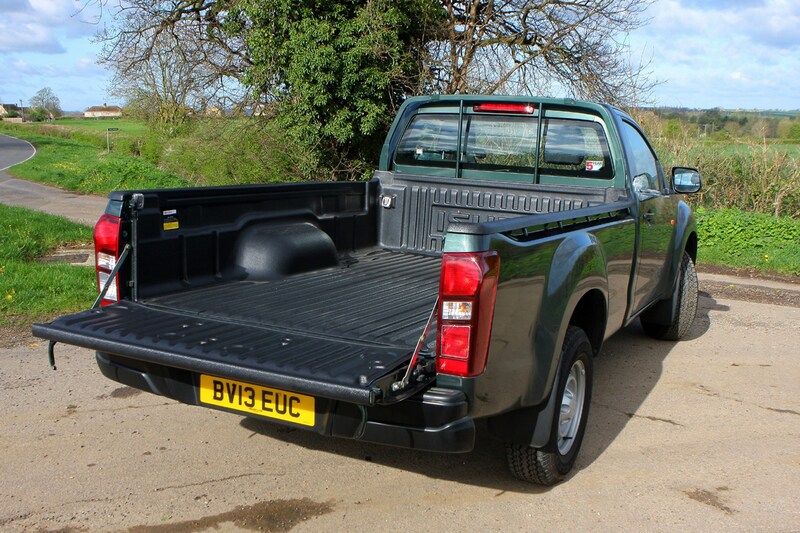 Our test vehicle was fitted with a Roll ‘n’ Lock load bay cover and bed rug. The bay cover is lockable but can be a bit tedious to use, while the bedrug offers little in the way of practicality because it's no better at holding loads in position than a normal load liner and is not very hard-wearing. Should I buy an Isuzu D-Max Fury 2.5? 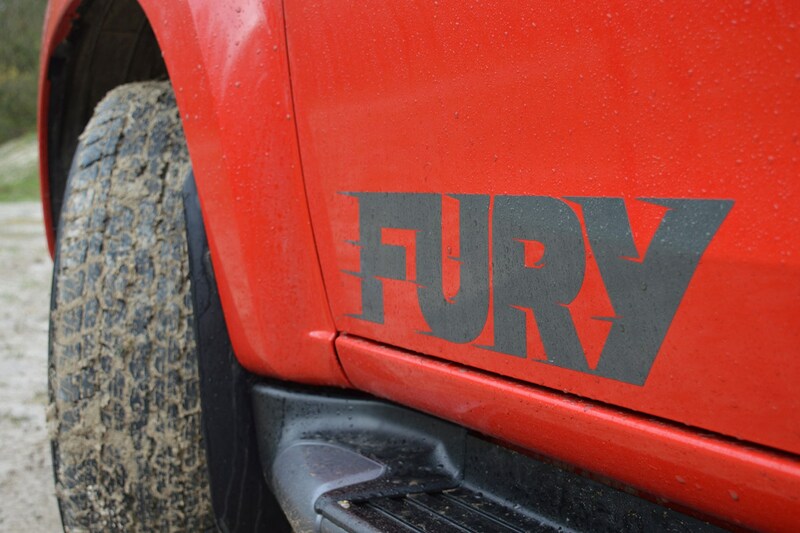 Built on a proven platform, the Fury looks the part, is fairly cheap to run with a 38.7mpg fuel economy and comes with a five-year, 125,000 mile warranty.